Sneak peak of Petite Blythe "Mademoiselle Chocolat de Q-pot."! Her gold dress is designed to look like a foil covering a chocolate bon bon. The frill on the dress makes her look really gorgeous! The necklace is sewn onto the dress with gold and brown two-tone colored beads. Her headdress is brown netting with gold and brown little ribbons, and adds a cute accent to the mademoiselle. Her little bag looks just like a piece of chocolate, and the Q-pot. logo is beautifully printed on the bag. The stand was designed to look like a chocolate, too! Her makeup is in warm beige tones. Her hair style is dark brown on surface and ash blonde underneath. This hair style represents Q-pot. 's cute and unique style. 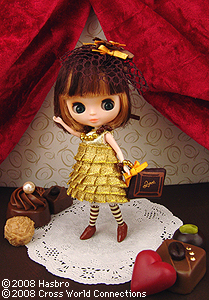 Our beloved chocolate turns to the cutest Petite Blythe! 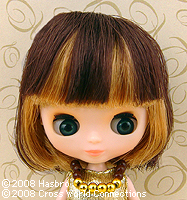 [ The set includes: ] Doll, headdress, dress with sewn in necklace, handbag, shoes, and stand.